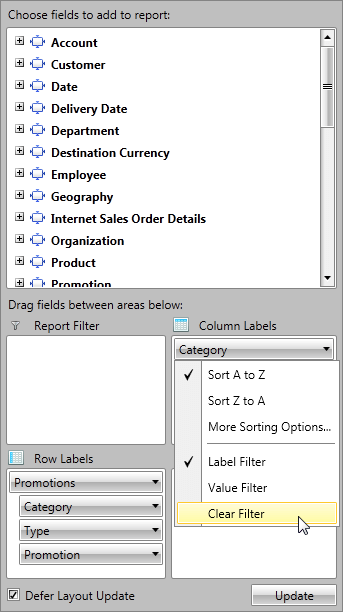 In this article we will show you how to apply different filters on your RowGroupDescriptions and ColumnGroupDescriptions when your data is from OLAP Cube. The Data in RadPivotGrid can be filtered based on several conditions to give you a view on specific details or just to make the report shorter. There are two types of filters you may use on your RowGroupDescriptions/ColumnGroupDescriptions. Label filter - filters the report based on the Header name. Value filter - filters the report based on one of the aggregates used. Here is the initial state of RadPivotGrid that we will use to show how different filters will change the report. equals - showing only groups which header fully match the parameter we pass. does not equal - showing all groups which header does NOT match the parameter we pass. contains - showing only groups which header contains the parameter we pass. does not contain - showing only groups which header does NOT contain the parameter we pass. Equals and does not equal are case sensitive and are using string comparison between the unique name of the member (defined in the Cube itself) and the passed parameters. Contains and does not contain are not case sensitive. OlapComparisonCondition - used to compare the Header with the value set in the Than property based on the Condition property. OlapComparisonCondition is used for "equals" and "does not equal" comparison. The value in Than property is case-sensitive. OlapTextCondition - used when you want to filter the data based on a string value defined in Pattern property. The Comparison property can have the values "contains" or "does not contain". The value of Pattern property is not case-sensitive. The value of "Than" property is the unique name of the member (defined in OLAP Cube). As you are unable to use & in XAML, you have to use & which will be parsed to &. You have to define sys namespace: xmlns:sys="clr-namespace:System;assembly=mscorlib". equals - show only members for which the selected measure fully matches the passed parameter. does not equal - show all members for which the selected measure does NOT match the passed parameter. is greater than - show only members for which the selected measure is greater than the passed parameter. is greater than or equal to - show only members for which the selected measure is greater or equal to the passed parameter. is less than - show only members for which the selected measure is smaller than the parameter we pass. is less than or equal to - show only members for which the selected measure is smaller or equal to the passed parameter. is between - show only members for which the selected measure is between the two passed parameters. is not between - show only members for which the selected measure is NOT between the two passed parameters. Value Filter is filtering the groups by number comparison between the GrandTotals of the groups and the parameters we pass, while Label Filter is a string filter. 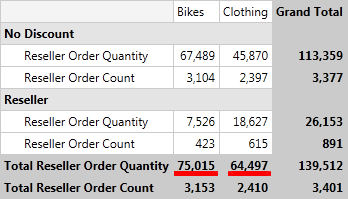 So if we apply a Value Filter on the Category ColumnGroupDescription, set condition "is greater than" for the AggregateDescription Reseller Order Quantity and pass as parameter value 50000 we will notice that two of the groups are missing because their GrandTotal is less than 50 000. ComparisonCondition - used to compare the Header with the value set in the Than property based on the Condition property. IntervalCondition - used when you want to show only data that is (not) between two values set in the From and To properties based on the Condition property.